Is it just me or does anyone else think that the supposed The Voice of the Philippines: The Battles doesn’t actually involve any battle at all but is an arranged elimination? I feel like the judges chose the first pair of contestants within their team based on a predefined biased pairing system where they have already preselected who to eliminate and who to save prior to the actual battle. They may have weighed the contenders and paired a weak singer with an outstanding one in order to remove a contender battle in their roster that they deem will not contribute much or won’t last long once live shows and audience voting begin. It was pretty obvious whom they will choose before the actual singing even started just by watching the interviews. It isn’t a real battle at all. Tristhan Perfecto, Morissete Amon, and Mitoy deserve to be selected against the co-team member they were paired against but I disagree with Bamboo for choosing Lee Grane. Her talent is undeniable as an artist but the show is about singers and voices where she lacks the power and vocal range needed to win the show or even last a day during live voting. Even guest mentor Joey Ayala thinks so. Speaking of guest mentors, each judge brought along popular musical icons to help them out mentoring and coaching the contestants within their team. It’s Arnel Pineda for Apl.de.ap. although he wasn’t around during The Battles; Joey Ayala for Bamboo and his team Kawayan; Gary V. for Sarah Geronimo; and Gerald Salonga for Leah Salonga. Yes, the renowned composer/musician is her brother who deserves recognition although I was expecting Ms. Lea to get Mr. Ryan Cayabyab at least. Apart from the missed battles, another noteworthy problem was during the blind auditions. Some auditionees deserved a slot but no one turned a chair for them yet many were selected who are quite lacking for any red button to be pushed and the judges hastily picked them. Also, the entire blind auditions episodes which were shown on TV for several weeks were most likely recorded for a whole day only. You will notice that the judges’ outfits were the same throughout the duration of the audition episodes. I’m wondering if The Battles segment which will likely last for a few weeks again on television was shot for one day only. We’ll soon see. For now, I’ll be looking forward to the next round and will guess who gets eliminated amongst paired contestants before the actual battle begins. 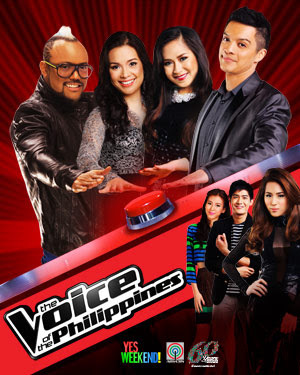 You can watch videos and replays of The Voice of the Philippines via www.thevoice.abs-cbn.com.